Whenever you check out any fitness website or magazine, buff and chiseled men and women stare back at you, toned, tanned and happy. Although many of those images are probably Photoshopped, it’s clear those people have put in their time at the gym. But maybe they’re on to something: Research shows that not only can weightlifting improve your body composition and give you a toned appearance, it can also improve your overall health and make you a happier person. Weightlifting can help you burn fat, reduce your risk of diabetes, prevent back pain and even help you fight depression. Read on to find out all the benefits of weightlifting. Want to eat that extra piece of pizza without feeling guilty? Lift weights. In study published in the February 2008 issue of Cell Metabolism, Boston University researchers demonstrated that type II muscle fibers, the kind you build when you lift weights, improve whole-body metabolism. The researchers genetically engineered mice with a type II muscle growth-regulating gene that could be turned on and off. After eight weeks on a high-fat, high-sugar diet, they activated the gene, but did not change the mice’s diet. Without any change in activity level, the mice lost total body fat. The researchers concluded that an increase in type II muscle fibers can reduce body fat without changes to diet and might be effective in the fight against obesity. When it comes to the effects of exercise on depression, aerobic exercise, such as running and swimming, has been much more extensively researched than anaerobic exercise, such as weightlifting. But as one study reports, there’s little difference between the two in terms of how well they relieve symptoms of depression. A study published in The Primary Care Companion to the Journal of Clinical Psychiatry in 2004, followed 40 women and found similar results in those who ran and those who lifted weights for eight weeks. In addition, there was no difference in the percentage of participants in the two groups who remained non-depressed during follow-up. 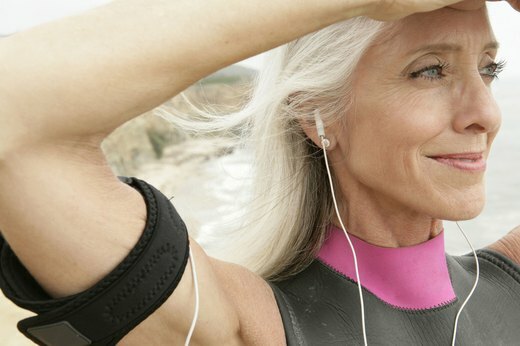 As you age, you naturally lose muscle and bone mass. This is of special concern for women, whose bones are smaller to begin with and can become dangerously weakened by age. Vivian Ledesma, D.C., owner and director of Alliance Healing Arts in Seattle, Washington, explains that weightlifting can help fight this. Just as your muscles adapt to the stress of weightlifting by becoming bigger and stronger, your bones also adapt. « Anytime your bones perceive stress, the response is that more bone will be deposited, » says Ledesma. Whether you’re into basketball or baseball, weight training in the gym will translate into better performance, says fitness expert John Carrico. He gives the example of a soccer player doing heavy squats in the gym: « Obviously, a soccer player doesn’t sit in the middle of the field and squat, but if he’s able to do a high-rep squat with 200 pounds on his back, and he’s in a high-intensity situation where he’s pushing his limits, then those muscles will be able to push at a high intensity on the soccer field. » Carrico, who co-owns Excellence Health and Fitness in Seattle, Washington, notes that weightlifting also improves dexterity, endurance and hand-eye coordination, all of which will help you be at the top of your game. Keep your ticker in top form by pumping iron, says a study conducted by researchers at the College of Health Sciences’ Department of Health, Leisure and Exercise Science at Appalachian State University. The study looked at what happens to arteries and blood flow after 45 minutes of moderate-intensity strength training and found that there was up to a 20 percent decrease in blood pressure — a benefit equal to or surpassing that of taking anti-hypertensive drugs. The blood flow-improving effects of resistance exercise persisted for about 30 minutes after the end of a training session and continued for as long as 24 hours in people who trained regularly — 30 to 45 minutes a few times a week. If you work in an office, you know that sitting at your desk all day can wreak havoc on your lower back, leading to stiffness and pain. Weightlifting may help strengthen the muscles of your core — those that support your spine — to lessen the discomfort and undo some of the damage caused by sitting all day. But what are the best exercises? Fitness expert John Carrico recommends focusing on hip extensions, essentially the opposite motion of the hip flexion that occurs while sitting. Squatting, step-ups and hip extensions are a few examples. Start with just your body weight and then add resistance to increase the challenge. Carrico also recommends abdominal exercises such as planking. Aside from your major muscle groups, like your pecs and hamstrings, your body has various smaller muscles called stabilizer muscles. These muscles do exactly what you would think: They help stabilize you. Although you might lift weights to flatter your flexing muscles, each time you work out you’re indirectly targeting those little muscles that help keep you upright and take care of everyday tasks such as balancing on one foot to reach a high shelf or stopping yourself from falling on an icy surface. This is especially important for people as they age. According to the Centers for Disease Control and Prevention, falls are the leading cause of injury-related death in adults over 65. Stop fearing the weights — lifting them is not going to turn you into a muscle-bound freak. Building huge muscles is intentional and takes a great amount of work, says certified strength and conditioning coach Mike LoBue, including lifting heavy weight at a high volume many times a week, following a weight-gain diet with copious amounts of lean protein each day and taking supplements. LoBue assures that lifting weights and eating a healthy diet will result in a fit and lean body, not a big and bulky one. When you feel stronger physically, you usually feel stronger mentally. Fitness expert John Carrico says that weightlifting teaches you the skill of perseverance, the ability to overcome discomfort and challenge yourself. « Weight training teaches you to push yourself when everything tells you to stop, when your muscles start to give out and it burns and it hurts, » he says. « When we get into those high-intensity situations, we have a choice, we can either stop everything and try to return to our comfort level, or decide that this level of discomfort is worth the reward. That decision — that it’s worth persisting through that uncomfortable situation –100 percent contributes to successful situations in other parts of our lives. Plain and simple, weightlifting is the best way to get a lean, toned, fit body — for both men and women. You can do all the cardio you want, but without some form of resistance training to challenge the muscles, you won’t get those toned muscles in all the right places, the ones that shape your body.